Team Romney’s digital command center routes real-time data on who has already voted and optimizes the the entire network of 36,000 volunteers to efficiently call and canvass couch-sitting supporters. Many states post the names of citizens who vote throughout the day, or permit campaign hounds to listen in as incoming voters check-in to polling places (by telling their name to poll workers). Upon seeing or hearing a name, Romney volunteers immediately wipe the voter’s name from the national database, so that volunteers don’t waste time calling or knocking on the door of someone who already voted. As votes roll in, Romney’s get-out-the-vote algorithm alerts campaign headquarters on which demographics of voters are underperforming (compared to the campaign’s forecasted goals). HQ then updates a legion of vans full of canvassers, spaced out no more than 20 minutes apart from one another in competitive states, with printable forms of addresses that need to be visited. Dan Centinello, Romney’s Deputy National Political Director, tells TechCrunch that the algorithm is powered by a survey of thousands of voters, which matches their favored presidential candidate with consumer data (such as which soft drink they prefer). Based on demographic and consumer data, the Romney campaign can predict with 93 percent accuracy which presidential candidate a citizen is likely to support, and optimize the entire national volunteer system to prioritize supporters who may not get to the polls, without encouragement, on Election Day. Knocking on doors is still the most effective method of boosting voter turnout, but as UPS figured out decades ago, computers can find the most efficient path for finding people who are likely at home. Organizer, a volunteer and canvasser logistics startup, brings UPS-like logistics to neighborhood get-out-the-vote workers, overlaying a walking path most likely to reach the important fence-sitting voters over a smartphone map. They recently partnered with popular campaign digital strategy platform, NationBuilder, to create a cost-effective solution to expand the number canvassers with smartphones. Cheap, Android-powered smartphones are FedExed to campaign offices, creating an army of algorithmically optimized volunteers literally out of a box. Recent large-scale, experimental evidence proves that Facebook can boost turnout on Election Day. Internet advocacy group, Fight for the Future and Planned Parenthood launched a clever Facebook app, Vote With Friends, that allows users to catagorize their friends into blocs of likely voters and message them with reminders to vote. The app tracks who has declared they voted on Election Day (presumably with the “I voted” button that Facebook puts out every election) and then tracks voting records post-election to see if the message had a meaningful impact. Like the GOP’s Orca, the Obama Campaign is using a real time voter app, Poll-Watcher, which monitors which Democrats stroll into the voting booth and then relays the information back to callers and canvassers, so that limited get-out-the-vote resources can be targeted to those who haven’t voted yet. Poll-Watcher connects to the liberal-friendly campaign organizer suite, NGP/VAN, that connects campaigns for president, congress, and local races, which means that the entire Democratic ticket can (theoretically) coordinate their get-out-the-vote efforts. Sometimes big data can fail…in hilarious ways. 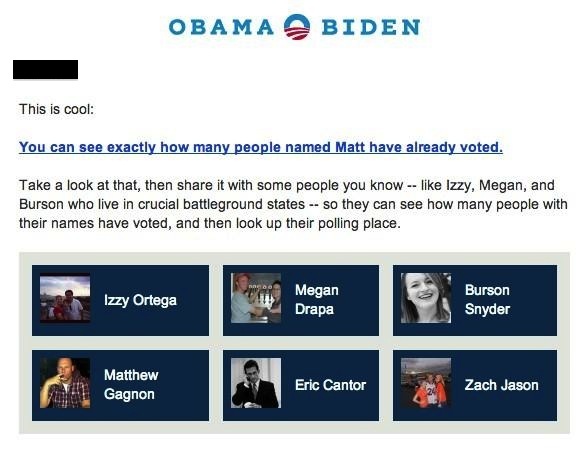 The Obama campaign apparently has the ability to email supporters with lists of their friends, and asks supporters to encourage their friends to vote. Unfortunately, as conservative digital strategist Vincent Harris noted on Twitter, sometimes the Obama campaign asks individuals on their email lists to encourage well-known Republican supporters, like Republican Leader of the House, Eric Cantor (oops!). For whatever reason, the Obama campaign cannot, or does not want to, distinguish between likely voters who favor Obama or Romney.